Our property is eight-tenths of a acre. The front yard is low maintenance with Camellia Japonica, Hydrangea and Camellia Sasanqua 'Yuletide' and a large Maple tree. This is the sign that greeted our visitors as they entered our garden. The front porch was bedecked with a beautiful potted plant I bought at Home Depot. Flowering Pear and Raywood Ash trees line the driveway. Walking under an arbor covered with a 'New Dawn' climbing rose brings visitors into "The Garden of Angels" with a view of different entertaining spaces. The kitchen area is for cooking and canning. An enclosed patio provides a place for shade loving plants and a fern grotto. The seating area is for conversation on warm summer evenings and watching TV. A fragrant circular rose garden is surrounded with potted herbs and a Dutchman's Pipevine leads to the hand built pergola. The pergola provides a place for tea time or evening dining and is surrounded by lavender, roses perennials and annuals. Other benches are placed along the path under an old shade tree. The large lawn area is bordered by a curved English cottage style garden with decorative statues, perennials, several types of roses and shrubs providing color spring, summer and fall. An additional park bench sits under a flowering plum tree. Growing along the fence are grape vines, and a plot where a summer vegetable garden is planted. One olive tree provides the best cured green olives. Behind the garage is a small area for potting plants and storing extra garden supplies. The vendors were in the back of the property selling mosaic garden decor, bird houses and wind chimes. The rose society sold a 100 miniature rose along the side of the garage. The cupids got dressed up with some sweet white Alyssum and Graham Thomas my David Austin rose bloomed profusely. Ingrid Bergman, Simplicity, St Patrick, Dream Weaver, Tiffany and my peonies were showing off at their best. I just planted strawberries and Bat Face Cuphea in the front part of this bed. Summer Kiss and my Butterfly Bush are doing wonderful. This is a great Gardening year. "Gardening is a journey-always changing and always so rewarding. This is one the of the beautiful bouquets that were sitting on tables. I have so many photos I just couldn't put them in one post. A vendor with metal garden are work was very popular. What an amazing day for me. It was a dream come true. Hope you enjoyed your tour and please come back soon. Oh so pretty! what a delightful day! Wow! 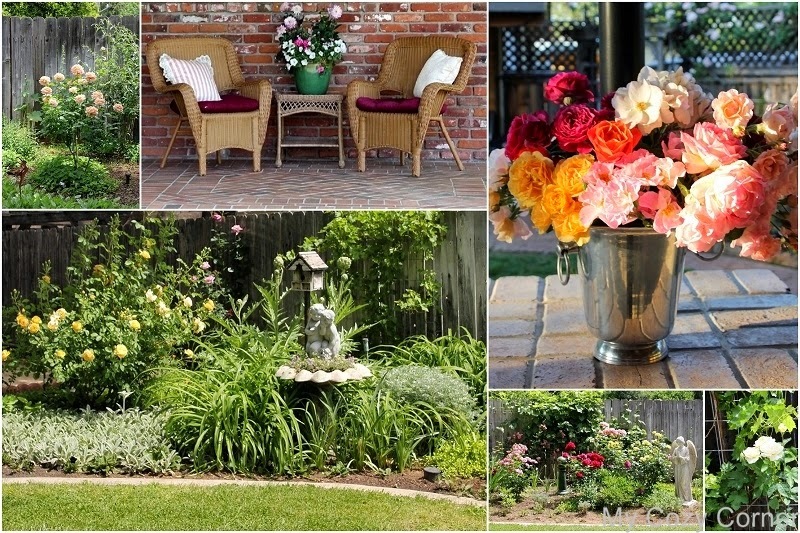 Yu have a fabulous garden with so many beautiful areas. It was so thoughtful of you to share your garden during this beautiful time of year. I loved your garden tour - where do you live at? If is close I would have loved to see your Garden Tour. Stop by my post and see the garden tours I went on. I just love taking in the tous - always get so many wonderful ideas from them. Your pictures are wonderful - thanks for sharing. Betty, your garden is just lovely and I'm sure everyone was thrilled to walk through it. Pretty blue tea set too beckons one to sit and enjoy a cup of tea while drinking in all the beauty. Thank you for sharing and coming to tea. I enjoyed the tour of your gardens, seeing the roses and a tea table made ready for guests. What a lovely tour today! A cup of tea is the perfect accompaniment to the walk through! I enjoyed the tour of your garden. I loved all the flowers and plants. The way the entrance is placed with the rose flag is very impressive. There is no words to describe the beauty of it. It happened to visit your blog. I'm very much impressed and enjoyed reading your posts and pictures. I'm following your blog now to come back to your site again. I'm glad to invite you to visit my blog, leave your valuable comments and follow my blog at "Join this site". This cyber tour of your garden was simply delightful. I'm impressed by all your hard work, patience and time posting these lovely photos. Congratulations on such a beautiful garden tour. It looks like it was a great success! Beautiful! I'm sure you never want to go inside with these lovely surrounding. Love your patio table set with the blue and white. How beautiful is your garden, I love your roses!